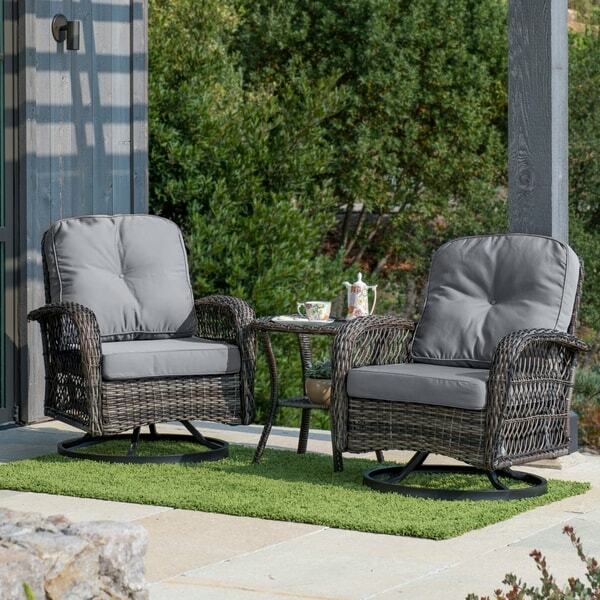 Create a stylish setting in your outdoor living space with this Livorno outdoor 3-piece wicker chat set by Corvus. Ideal for small spaces, this 3-piece compact patio set comes with two swivel club chairs and a side table. It is made with metal frames and hand-woven resin wicker for sturdiness. The side table with glass top and open shelf at the bottom provides much space for storage. The plush cushions add to its overall comfort and make it perfect for intimate outdoor gatherings. I LOVE these chairs for my deck. They were a PITA to put together, but once on was done, the second was easier. Highly Recommend... swivels, rocks, and the table is really nice, too! I bought these swivel chairs along with a Corvus rocking chair and another patio set. All of the pieces are very pretty and comfortable. Matched my rug great and everything looks great. I am going to scotch guard the cushions just to be on the safe side from the sun. Plenty of hardware for putting them together, but you will need two people to do it. My hubby had a better tool than what they sent. Worked out great. Would recommend this, especially if your looking for grey wicker. As you can see by the condition of the box that I received, I had very significant concerns as to the condition of my wicker set. The box was severely damaged and was mostly held together with tape. I think the item was previously sent to someone else who returned it or the box fell off the truck three or four or five times. As the red string that is supposed to hold the hardware is visible, one would think the hardware was attached, as it should be, it was not, it was within a separate box. The box easily came apart, once all the tape was cut. I sorted all the pieces, checked them for damage … and commenced the extensive task of assembly. The first chair had holes that did not align, which I assume is why the previous recipient of this set returned it … I could not have returned it as the box disintegrated once the tape was removed. My son-in-law finished putting the chair together for me and I was able to complete the other chair and the table myself. Cute set … I did not appreciate the condition of the box upon its arrival or the holes that did not align. I would prefer the back rest to have been higher to rest my head against. I do really like the look of the set. Not at all impressed with its appearance upon arrival. The Wicker Chair Set is wonderful and is exactly how it is described and looks. Love it! But what was even nicer, was how Overstock took care of a problem, the fist set came with NO hardware or instructions and the box was all beat up and you could see how it had been re-taped. There had been some damage to at least one o two pieces so I called them and they were very nice about all of it, sent me out a new set immediately. I asked what I should do with the first set and was told that I would hear back from someone at Overstock within 10 days. If I did not hear back then I could do whatever I wanted to with the first set. Since it has only been 10 days, not sure hat I will do. Maybe I will check it out and see if the pieces can be repaired or not or I can just dispose of it. Now that is customer service!!!! Thank you Overstock for being very professional and making sure that I would be taken care of in a very timely manner!!! This 3 piece Corvus Livorno wicker patio set has exceeded my expectations! The pieces are beautiful, sturdy and comfortable. Very easy to assemble also. Would highly recommend! Beautiful, comfortable set. Love the gray wicker color, very modern feel. They are a great quality made set. We can't wait to use them on our new front porch. I would definitely recommend this buy! I love that the cushions are thick and seem to be made well. I can't wait to spend summer evenings on my new patio furniture. The 3 piece set was worth the money. I wasn't certain about my choices when I made this purchase. It's withstood high winds and extreme weather conditions on my porch. My neighbor asked if she could get the same one as me. That was a nice compliment. Over all a comfortable chair. I'll recommend it. I live in the Midwest and it was cold today but I couldn't help sitting in these chairs for a few minutes! They look great and they felt so comfortable. I will probably add a pillow just to add some color but other than that, I just need a cup of coffee and some warm weather - these chairs will do the rest! Just a fyi: the box weighs about 85 lbs and it took about an hour to assemble. Great quality. The cushion are nice a thick. We love the swivel so we don't miss out on any conversation going on outside. Well made. Putting together was really simply and looks great on our patio. Pretty and comfortable. Assembly is of course required but a very nice set, perfect for enjoying my mornings on the back porch. "Do these swivel chairs rock also?" These chairs glide backwards and forwards. The weight limit for each chair is approximately 300 pounds. I've been looking for a quality set of swivel wicker chairs and overstock had a great price! "What kind of metal is the frame. We live in a humid climate and I am concerned about the moving parts rusting." The frames are made of steel.